The use of waveform capnography has become standard in many paramedic protocols involving advanced airway management. Continuous waveform capnography is considered the gold standard for confirming endotracheal tube placement, and has become an integral part of cardiac arrest algorithms and monitoring the quality of chest compressions. The American Heart Association 2010 guidelines recommend capnography as a reliable means of assessing for a return of spontaneous circulation during cardiac arrest. These uses of capnography have shown to be beneficial in the pre-hospital setting. However, the use of waveform capnography as a monitoring and diagnostic tool extends far beyond airway management and cardiac arrest. 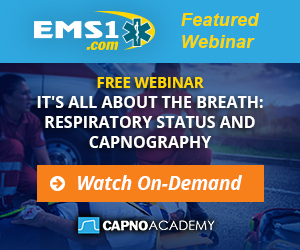 What exactly is capnography, anyway? Very simply, capnography is a measurement of the concentration of carbon dioxide in respiratory gasses. End tidal capnography (EtCO2) is a measurement of the amount of carbon dioxide at the end of the exhaled breath. Capnography measurements are often displayed or recorded as a waveform, called a capnogram, which has a consistent square shape when normal. Abnormal waveforms can be rounded, inconsistent, or have a “shark fin” shape. Capnography is measured in millimeters of mercury (mmHg), with a normal range being 35-45 mmHg. Capnography differs from pulse oximetry in that pulse oximetry measures oxygenation of the blood, while capnography is a measurement of overall respiratory system function. Capnography devices shine an infrared light through a stream of air in an endotracheal tube or nasal cannula onto a sensor. Carbon dioxide absorbs infrared light, so by measuring the amount of light that hits the sensor, the device is able to calculate the partial pressure (concentration) of carbon dioxide in the stream of air. The first capnography devices, developed in the 1960’s, were large and practically impossible to use in the clinical setting. Today, capnography capabilities are integrated into the majority of field cardiac monitors, and stand-alone portable capnography devices are about the size of a deck of cards. Carbon dioxide is a normal byproduct of the cellular respiration process that the human body uses to convert glucose into life-sustaining energy. At the cellular level, carbon dioxide, along with other waste products like hydrogen, moves into the bloodstream and is transported through the body to the lungs. As the blood passes through the capillaries surrounding the alveoli, carbon dioxide moves into the lungs and is exhaled. The concentration of carbon dioxide in the body can be a direct representation of cellular function. Monitoring the concentration of exhaled CO2 (EtCO2) can provide insight into the health of a patient at the most basic, cellular level. An EtCO2 reading that is lower than normal indicates too little carbon dioxide in the respiratory system, as is the case in hyperventilation or alkalosis. EtCO2 readings that are higher than normal indicate a buildup of CO2 and waste products, as is the case in hypoventilation or acidosis. The benefits of capnography monitoring stretch far beyond advanced airway placement and evaluating CPR quality. At a very basic level, the use of capnography can provide an accurate respiratory rate in a matter of seconds, and can supplement the traditional manual count for 30-60 seconds. Obtaining an accurate respiratory rate in a chaotic field setting can be challenging, and recorded respiratory rates are often inaccurate. With the introduction of nasal cannula capnography devices and advances in integration with field cardiac monitors, capnography can be used as a quicker, more accurate tool for obtaining, confirming, and monitoring respiratory rates in the field. Capnography also provides continuous, real-time information on a patient’s respiratory rate. This allows for early recognition of changes in respiratory status and aggressive intervention by care providers. Waveform capnography is also a useful tool in patients with multiple complaints or a complicated medical history. The shape of the waveform itself provides insight into the exact etiology of a patient’s respiratory compromise. A capnogram showing a peaked or “shark fin” shaped pattern is indicative of incomplete or obstructed expiration found in patients with asthma or COPD. Capnography is valuable for hyperventilating patients. The visual representation of respiratory rate via waveform can allow patients experiencing anxiety-related hyperventilation to self-regulate their respiratory rate, leading to a resolution of symptoms. When used as a means of assessing metabolic function, capnography can be valuable in identifying and monitoring diabetic patients experiencing a hyperglycemic event. In these patients, rapidly rising EtCO2 readings can be an indication of changes in the metabolic state of the patient and allow for quicker identification of ketoacidosis in the pre hospital setting. In a study of pediatric patients with diabetes, nasal cannula capnography combined with clinical assessment was successfully used as a predictor for diabetic ketoacidosis. Capnography is also useful when treating patients at risk of respiratory depression or failure. In patients with acute alcohol intoxication, capnography can help identify harmful respiratory depression that might be missed by traditional Sp02 monitoring alone. While a slow respiratory rate may detectable during a physical exam in the pre-hospital setting, respiratory depression that manifests as a low tidal volume is difficult to detect during clinical examination. The use of capnography in patients vulnerable to respiratory failure (narcotic overdose, alcohol intoxication, etc) can result in a greater detection of respiratory depression and allow for earlier corrective action. In these patients, rising EtCO2 readings provide early indication of respiratory depression and the need for more aggressive interventions. Capnography can provide helpful diagnostic information in patients with suspected pulmonary embolism (PE). In a study of 100 patients with signs and symptoms of pulmonary embolism, EtCO2 monitoring was successfully used as a screening tool to rule out a PE. EtCO2 readings within normal limits successfully ruled out pulmonary embolism in 100 percent of patients not experiencing a PE. Subsequently, patients with abnormal EtCO2 readings or atypical waveform patterns were more likely to be experiencing a pulmonary embolism. The addition of EtCO2 monitoring when caring for trauma patients can provide helpful information on the overall condition of the patient and can be predictive of outcome. In a study of multi-system trauma patients, falling EtCO2 readings were associated with hemodynamic instability, uncontrolled hemorrhage, and death. In a study of boxers with chronic traumatic brain injuries, EtCO2 levels were successfully used as a way of monitoring cerebral hypo-perfusion following concussion. This suggests that EtCO2 monitoring may be a valuable addition to the field assessment of cerebral hemodynamic function in traumatic brain injury patients. Capnography may also be a helpful addition when caring for and monitoring pediatric patients. Monitoring expired carbon dioxide is helpful in monitoring overall respiratory status and airway patency in infants and children. For the common pediatric complaint of vomiting and diarrhea, EtCO2 monitoring can help determine the severity of a child’s condition. High end tidal carbon dioxide levels have been shown to be a non-invasive measure of metabolic acidosis in pediatric patients with signs of gastroenteritis. The use of a capnography as a monitoring tool can be beneficial for most patients in the pre-hospital setting. Whether it is used as a basic means of tracking respiratory rate, or used to evaluate a patient’s overall metabolic function, capnography is a valuable addition to patient care. As the technology surrounding capnography monitoring advances, this diagnostic tool should become even easier to use with every patient, on every call. 1. Edwards, A., D. Carapiet, and K. Torlot. “The Use Of Capnography To Confirm Tracheal Intubation During Cardiac Arrest.” Anaesthesia 66.9 (2011): 844-845. 2. Kodali, Bhavani Shankar, and Richard D. Urman. “Capnography During Cardiopulmonary Resuscitation: Current Evidence And Future Directions.” Journal Of Emergencies, Trauma & Shock 7.4 (2014): 332-340. 3. Craig, Karen Jean, and Mary Patricia Day. “Are You Up To Date On The Latest BLS And ACLS Guidelines?.” Nursing 41.5 (2011): 40-44. 5. Manifold, Craig A., et al. “Capnography For The Nonintubated Patient In The Emergency Setting.” Journal Of Emergency Medicine (0736-4679) 45.4 (2013): 626-632. 6. Howe, Teo Aik, et al. “The Use Of End-Tidal Capnography To Monitor Non-Intubated Patients Presenting With Acute Exacerbation Of Asthma In The Emergency Department.” Journal Of Emergency Medicine (0736-4679) 41.6 (2011): 581-589. 7. Grishin, O., V. Grishin, and D. Uryumtsev. “Capnographic Parameters Of The Breathing Pattern In Healthy Adults And Patients With Psychogenic Dyspnea.” Human Physiology 38.4 (2012): 389-395. 8. Agus, Michael S. D., Jamin L Alexander, and Patricia A Mantell. “Continuous Non-Invasive End-Tidal CO2 Monitoring In Pediatric Inpatients With Diabetic Ketoacidosis.” Pediatric Diabetes 7.4 (2006): 196-200. 9 Yuri Gilhotra; Porter, Paul. Journal of Paediatrics & Child Health. Oct2007, Vol. 43 Issue 10, p677-680. 4p. 1 Chart, 3 Graphs. DOI: 10.1111/j.1440-1754.2007.01186.x. 10. Langhan, Melissa L. “Acute Alcohol Intoxication In Adolescents: Frequency Of Respiratory Depression.” Journal Of Emergency Medicine (0736-4679) 44.6 (2013): 1063-1069. 12. Hutchison, Rob, and Les Rodriguez. “Capnography And Respiratory Depression.” American Journal Of Nursing 108.2 (2008): 35-39. 13. Riaz, Imad, and Badie Jacob. “Pulmonary Embolism In Bradford, UK: Role Of End-Tidal CO2 As A Screening Tool.” Clinical Medicine 14.2 (2014): 128-133. 14. Dunham, C. Michael, et al. “In Emergently Ventilated Trauma Patients, Low End-Tidal CO2 And Low Cardiac Output Are Associated And Correlate With Hemodynamic Instability, Hemorrhage, Abnormal Pupils, And Death.” BMC Anesthesiology 13.1 (2013): 20-27. 16. Cote, Charles J., et al. “Endtidal Carbon Dioxide Monitoring In Children With Congenital Heart Disease During Sedation For Cardiac Catheterization By Nonanesthesiologists.” Pediatric Anesthesia 17.7 (2007): 661-666. 17. Nagler, Joshua, Robert O. Wright, and Baruch Krauss. “End-Tidal Carbon Dioxide As A Measure Of Acidosis Among Children With Gastroenteritis.” Pediatrics 118.1 (2006): 260-267.